This rips through soap scum just like the spray version of Shower Power. I think this is more wasteful though as you get better coverage and control where the spray version goes. I find it harder to get the liquid where you want it to go and the container gets used up a lot faster as well. The smell is amazing but definitely use gloves as it can dry your hands out. This product works really well. Cleans the shower perfectly. The squeeze pack is better as it gives a deeper clean. Great value product. My Mum has been using this product for as far back as I can remember and I now use it in my household. It is a yellow liquid which you spray on grime and soap scum. You give it a few minutes then easily clean away for beautifully clean surfaces. It has a highly toxic scent so definitely don’t use in confined spaces, unventilated space or around children or animals. The squeeze bottle is great for applying to large ground surfaces like pavers or for filling up the bottle which comes with the trigger. 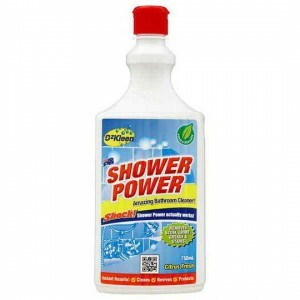 How would you rate Ozkleen Shower Power Shower Cleaner Squeeze Pack? Finish Dishwashing Tablets Max In !